Watched Sergio Leone’s magnificent spaghetti western Once Upon a Time in the West again last night; my enthusiasm for it remains undimmed by the demoralising revelation that it is also one of Paulo Coelho’s favourite movies. The film isn’t as well known in India as Leone’s Dollars trilogy (especially The Good, the Bad and the Ugly) which preceded it, but in my mind there’s no question that it’s his best work. And it’s ironical that it isn’t better known out here. For actually, even Indians who haven’t seen this masterpiece know it quite well by proxy – through one of this country’s most beloved movies, Sholay. The films that are most often cited as having influenced that great "Indian western" include Peckinpah’s The Wild Bunch (for its pathbreaking handling of action: the slow-motion deaths of men on horses, the painfully detailed attention to the trajectories of bullets as they enter and exit human bodies); Kurosawa’s The Seven Samurai and John Sturges’ The Magnificent Seven (for the ‘hired gun’ theme) and even Butch Cassidy and the Sundance Kid (for the wisecracking buddy relationship between the two leading men). Leone’s spaghetti Westerns with Clint Eastwood are sometimes named in this context, but I can’t quite recall Once Upon a Time in the West being specifically cited as a Sholay source. Which is odd, since the inspiration for the latter film’s most memorable character – the villainous Gabbar Singh – comes from Leone’s movie. Further, the look and feel of Ramesh Sippy’s film – with such elements as the eerie sound of a swing creak ing in the wind, and the association of a harmonica with a central character -- owe more to Once Upon… than to any other international production I can think of. And even one of Sholay’s most visceral sequences – that of the Thakur’s family being slaughtered, complete with the agonising wait before a little boy is killed point blank by the central villain – is taken directly from Leone’s movie. There’s another connection. By all accounts, Amjad Khan was an unpopular choice to play Gabbar Singh in Sholay. The thought makes us shake our heads in disbelief today, but back in 1974 the film’s scriptwriters Salim-Javed thought he was all wrong for the role; he had a weak voice, they said! In Once Upon a Time in the West, the villain was played by Henry Fonda, and this too was one of the most controversial yet effective casting choices in movie history. For over 30 years before this film was made, Fonda had epitomised Decent Americana. In movies directed by the great John Ford – the preeminent chronicler of American history on film – he had played Tom Joad, Wyatt Earp and Abe Lincoln: some of the most revered figures (real and made up) in the short corpus of legends that a young country without a mythology had managed to create for itself. His intense, searching eyes and his hesitant voice seemed to open a doorway that led straight into the soul of the sincere working-class American man. Fonda was in his early sixties when he got word that Leone, an Italian director who had been making unconventional but successful "Dollar Westerns", wanted him to play the villain in his new film. The actor in Fonda rose to the challenge; in his autobiography, he relates how, for his meeting with Leone, he grew a beard and used contact lenses to turn his blue eyes black, in keeping with the scruffy Lee Van Cleef-ish image of a spaghetti western villain. But it wasn’t long before he realised that the tempestuous director wanted his face as it was, with blue eyes and firm jawline intact; for as soon as Leone saw him, he exploded into a string of incomprehensible Italian phrases punctuated by the English words "Shave! Shave!" and "Blue eyes! I want baby blue!" It was the genius of Leone to take Fonda as he was and use him against type, to chilling effect. But that’s scarcely the only thing Once Upon... has to recommend it. It has a fascinating cast – the other key members being Charles Bronson (whose strong, silent Harmonica makes Clint Eastwood look like Stuart Little), the lovely Claudia Cardinale, and that wonderful character actor Jason Robards. And it has one of the most mesmeric original scores ever, by the incomparable Ennio Morricone, who creates separate themes for each of the four protagonists. All of this adds up to the great final showdown between Bronson and Fonda that is far more about panoramic cinematography, the human face (with extreme close-ups of the weather-beaten faces of the two men) and the use of music in film than it is about the actual shootout, which takes half a second. Watch Once Upon a Time in the West for its Sholay links if you must. But you’ll come away from it as a fan number 1 of the film in its own right. Paulo Coelho has company. Rubaru has also enlisted in the OUATIW fan club thanks largely to you. Do continue the good work of spreading film literacy by writing on cinema and lending your VCDs\DVDs to people like me. have seen most of the films you mention, and many other similar-themed ones. But I'm not talking about content here so much as form. The "hired mercenaries" theme is much older than cinema (it certainly didn't begin with The Seven Samurai, which most people hold as the original source for Sholay). But in terms of actual treatment I still think Sholay is far closer to Leone and Peckinpah than to Ford. Having said which. Sholay remains as special to me as it ever was, even with knowledge of all the idea-lifting. Completely agree about the Sholay link. I think Once upon.. was pretty rare to come by in India earlier, compared to the Dollar trilogy or The Magnificent Seven. Maybe that was a reason why very few people spotted the similarities. yes indeed there was a link,but sholay is greatest movie that has some great collection of dialogs that other films didnt deliver like one on my fav "sala nautanki"
Sholay owes a lot to the Spaghetti Westerns and American Westerns. Having owned the copies of the best SWs, I can say without these Sholay, as we know it, wouldn't exist. I completely agree on your analysis..it's true.. I watched both the movies and I was trying to find a connection between them and it makes sense what you wrote.. I don't know why, but seeing Angel Eyes shoot Baker's family always reminds me about the scene where Gabbar shot Thakur's family. I haven't seen Once upon a time in the west but it's high on my to-watch list. Nice blog post... liked your writing. Checked the "about" section, and nice to know you are a writer / author. 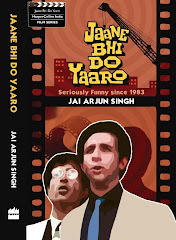 I suppose I should check out your book on "Jaane Bhi Do Yaaron"... another classic.